Once a year, my friend Colleen and I pack ourselves into her Honda for a trip to pick peaches at Mood’s Farm in Mullica Hill, N.J. Once we make it over the Betsy Ross Bridge, the drive to our destination is a short one. Soon we’re in the orchard, shaded by the sickle-shaped leaves of the peach trees. 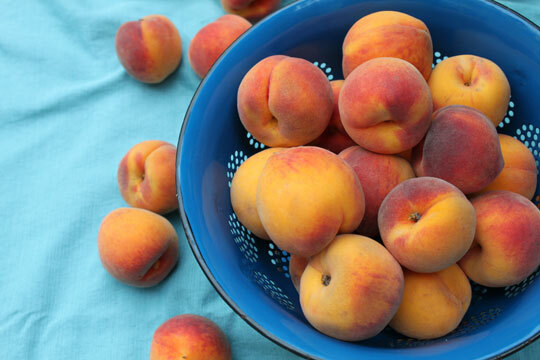 Relative to pick-your-own berries, peaches accumulate quickly, and it can be difficult to gauge when enough is enough. When we’ve tired of eating them fresh, in pies or chopping them into salsa, we slice and freeze them for smoothies, or opt to can them. Don’t be intimidated by the canning process. This Peach-Jalapeño Barbecue Sauce requires little more equipment than what you'd need to make pasta. Soon you’ll be spending an evening crowded around a grill, basting a chicken with the sweet, spicy sauce, and sipping a sangria featuring locally produced white wine. Peel, pit and puree the peaches in a blender or food processor. Prepare a boiling water canner and sterilize 4 half-pint jars by boiling them for 10 minutes. Wash jar lids and rings, and bring to a simmer in a separate small saucepan. Don’t allow lids to boil. Turn off heat and allow jars, lids and rings to sit submerged until you need them. In a wide, non-reactive pan, combine all ingredients and bring mixture to a boil. Reduce to a simmer and cook, stirring occasionally, until mixture has thickened and darkened slightly. About 30 minutes. When sauce has reached desired consistency, turn off heat and skim any foam from the top with a spoon. Ladle sauce into prepared jars, leaving a half-inch of head space. Wipe the rims of the jars with a clean kitchen towel, and seal with lids and rings. Place sealed jars back in canning kettle. Once all jars have been added, ensure that the water level clears the lids by at least one inch. Add more water if necessary and bring water to a boil. When water boils, set timer for 15 minutes. After 15 minutes, turn off heat and allow jars to sit in water for five minutes. Then, using a jar lifter, remove jars to a cooling rack. Once jars have reached room temperature, remove rings and test that all jars have sealed properly (the center of the lid should not pop when pressed). If any have not sealed, store them in the refrigerator. Store other jars in a cool place. Prepare grill for indirect cooking and preheat to medium-high. Toss chicken pieces with vegetable oil until coated. Season generously with salt and pepper and place on grill, skin side down, directly over the flame/coals. Grill for 5 to 10 minutes, enough to get a nice color and grill marks. Once chicken has been seared, flip and move to the cool side of the grill. If cooking on gas, reduce flame to medium-low. Cover grill and allow chicken to cook for 25 to 30 minutes. Remove cover, flip chicken pieces, and brush them with a thin layer of barbecue sauce. Replace cover and cook for 15 minutes. Repeat, turning, basing, covering and cooking in 15-minute intervals until the chicken is completely cooked through. Total cooking time should be 1.5 to 2 hours. Brush with more barbecue sauce and serve.